Crest Precast constructed a 36 unit Afgan village for a training area at Fort McCoy, WI. Crest Precast constructed a 36 unit Afgan village for a training area at Fort McCoy, WI. 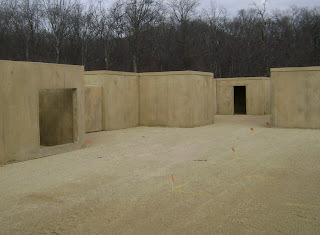 This project consisted of rooms cast with colored concrete. Installation also included precast tunnel sections. Sections are reinforced and use 6,000 psi concrete. This area will be used in 2010 to train combat troops in entry and search methods. We are proud to supply such a important component for our troops. A 225,000-sq.-ft., dual-textured sound wall was recently completed as part of a three-year project to rebuild U.S. 52 through Rochester, Minn. It involved reconstruction of three interchanges, addition of one more, and widening of the entire 11-mile portion — and at $232 million, it became Minnesota's largest-ever single-outlay for a road project. Barneveld, Wis.-based Crest Precast Inc. supplied 3,000 precast panels and 800 precast posts and caps for the sound wall, comprising 20-ft.-high walls embedded in a caisson and 10-ft. walls surface mounted by means of an anchor bolt and plate system. The first project in Minnesota incorporating a dual-textured panel, both sides feature identical designs to accommodate viewers from any vantage point. Casting panels in a vertical gang form provided equal stone texture on both faces. Formliners manufactured specifically for the project and a two-color staining system applied after erection contributed to the finished look. 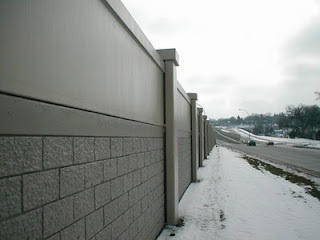 National Precast Concrete Association- and Minnesota DOT-certified, Crest designed the texture and obtained state and city approval of final sound wall plans.